Growing plants in pots is the easiest way to have plants for shipping. If plants are dug from the ground for shipping, they must have all native soil removed from the roots. The tops then have to be cut back to match the amount of root present. If growing plants in pots with artificial media, this doesn't need to be done. Remove the plant from the pot... to use the pot over and to decrease the weight for shipping, knock as much soil off the root ball that will come loose easily. Then, wrap the root ball in wet paper towel, then saran wrap, and then roll the whole thing up in newspaper. If it seems like the plant is still too heavy, break up the root ball a little and shake as much soil from the roots as will come off. If it still is very heavy, swish the root ball around in a bucket of water to remove more soil. Be sure to cut the plant back by about half. Do not remove soil or cut back tomatoes or African violets. They are usually light enough to ship as they are. The African violets need special packing and that will be addressed in another article or e-book. 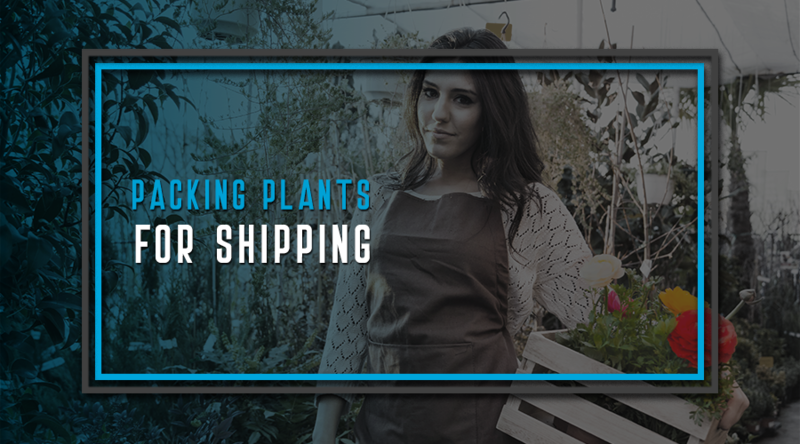 Choose only those plants that are in tip top condition to ship. Spending up to 3 days in a box is very hard on them and you need good sturdy plants to handle the trip. Plants must get to their destination as quickly as possible. I suggest using the US postal service priority mail. Most times, the plants arrive in 2 days, 3 at the most. Shipping on Sat. insures the plants arrive on Monday even coast to coast. Mail moves 24/7/365 and there isn't any business mail on the weekends so everything moves through the system quicker. I don't like the plants to be in transit any more than 3 days so the customer does not have to struggle to save it. Offer a live delivery guarantee and offer to replace or refund if the plants arrive dead. Pictures must accompany their claim. Of the thousands of plants I have shipped over the years, I have not had to replace very many. Include some type of directions on how to help the plant recover from the shipping. The following is directions on how to take care of the plant when it arrives. You may use these directions or can come up with something of your own using the same info. Plants that spend up to 3 days in a dark box need a little TLC when they arrive. Take them out of the box, remove any damaged leaves or stems. If they are very dry, soak them for a couple of hours in warm water. If in need of water, just pot up and water. Pot up in any good soil media or plant outside if danger of frost is past. Because their foliage has become tender in the dark box, keep the plants in bright light but not direct sun for the first day or so. If outside, shade in some way. The second or third day, let them have a few hours of morning sun. The next day after that, a few more hours, and by the 4th day, let them have as much sun as they are supposed to like. Keep well watered during establishment. If they should wilt during the day, and not recover at night, cut the plants back further. If the plants grow in rosettes, remove some of the outer leaves. The cost of shipping is paid in advance by the customer at the time of purchase. The difficult part is trying to figure out how much something weighs. Shipping cost is calculated by weight and the distance it will travel. Postage Price Calculator is on the website of the Vipparcel.com. Plug in the depart zip code and arrival zip code and the weight and see the options. Choose the priority mail shipping. Do not be tempted to use the flat rate boxes. They just aren't the correct size to allow good, sturdy packing of the boxes. In regard to boxes, one can scavenge boxes from stores but the easiest is to order priority mail boxes. Post offices do not offer the best sizes in their lobbies and it's best to order the correct sizes on line at USPS Online Store. You will need to create an account but don't worry, priority mail shipping boxes are free. The best sizes for plant shipping are the number 4's which are 7x7x6, number 7's which are 12x12x8. Another one that is handy for taller plants is the shoe box. It measures 14x7x5. When packing the boxes, keep in mind the following. The plants need cushioning from bumps and drops and insulation from cold and heat. A good material to use is paper shred for packing material. Wadded up newspaper can be used, packing peanuts, etc. Put a layer on the bottom, lay in a layer of plants, then arrange more on top of them. Then pack firmly, but not too tight and not too loose, more shred on the sides and top. Make sure there is at least an inch of shred between the plants and the side of the box. The test to see if they are packed well is to close the top and shake the box. You should not hear anything moving. Put in the directions and a gift. I like to give seeds as a gift or sometimes if I have a lot of the same plants, I include an extra plant. This makes customers very happy and it costs you practically nothing. Happy customers are returning customers. Happy customers recommend you to others. Tape up the box. If it is very hot or going to a very hot place, drill a dozen or so holes in the box for ventilation. Do not do this in cooler weather. There are a couple of ways to address the box. I prefer using on line postage payment which allows you to pay for the postage and get a shipping label printed. If not, you have to print the address and take the package to the post office to be weighed and pay for the postage. I bought a little postal scale from the post office and it is probably on line in their shopping area as well. It was about $35. This allows me to weigh the boxes to get the correct shipping. Always round up no matter if the weight is only a.1 over. For example, if the package weighs 1.1lbs, it must be calculated as 2 lbs. Get delivery confirmation at the time the postage is paid for either online or at the post office. It is generally free online. Send the tracking number to the customer. This allows them to check on the status of the package as well as the seller to know when it arrived. This concludes the series of articles written for selling and shipping plants online.